An introduction for everyone. 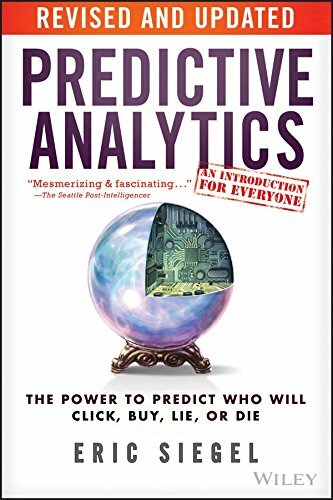 In this rich, fascinating â surprisingly accessible â introduction, leading expert Eric Siegel reveals how predictive analytics (aka machine learning) works, and how it affects everyone every day. Rather than a âhow toâ for hands-on techies, the book serves lay readers and experts alike by covering new case studies and the latest state-of-the-art techniques. How? Prediction is powered by the world's most potent, flourishing unnaturalÂ resource: data. Accumulated in large part as the by-product of routine tasks, data is the unsalted, flavorless residue deposited en masse as organizations churn away. Surprise! This heap of refuse is a gold mine.Â Big dataÂ embodies an extraordinary wealth of experience from which to learn. Predictive analyticsÂ (aka machine learning)Â unleashes the power of data. With this technology,Â the computer literally learns from data how to predict the future behavior of individuals. Perfect prediction is not possible, but putting odds on the future drives millions of decisions more effectively, determining whom to call, mail, investigate, incarcerate, set up on a date, or medicate. Five reasons why organizations predict death â including one health insurance company. How IBM's Watson computer usedÂ predictive modelingÂ to answer questions and beat the human champs on TV'sÂ Jeopardy! How companies ascertain untold, private truths â how Target figures out you're pregnant and Hewlett-Packard deduces you're about to quit your job. A truly omnipresent science, predictive analytics constantly affects our daily lives. Whether you are a consumer of it â or consumed by it â get a handle on the power ofÂ Predictive Analytics.